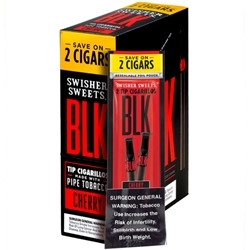 Enjoy sweet natural black and mild pipe tobacco with a perfect mixture of cherry flavors each time you smoke Swisher Sweets BLK Cherry Tip Cigarillos. Created with a unique mix of tobaccos that are covered with a natural wrapper and fastened with a black tip. Each of these BLK Tip Cigarillos gives a promise of rich taste and heady aroma with a smooth draw and slow burn. Try them today at Smokers Discounts!